From February 4 – 5, 2017, aspiring game developers gathered to the University of Waterloo Stratford Campus to learn how to design, develop, and test a digital game. With a unique focus on games for mental health, wellbeing, and fitness, this was an exceptional opportunity to explore an emerging digital media area. This two-day hands-on workshop took participants through one rotation in the iterative development cycle of a game and provided essential training to build a game from scratch. The University of Waterloo Stratford campus runs user-experience weekend workshops (or hackathons or developer camps) twice a year to provide students with an opportunity to expose their ideas to the real world and get feedback about their commercial viability and the business opportunities (with feedback provided from industry partners from the Stratford Accelerator Centre). #GameDIAD was organised by SWaGUR co-applicant, Dr. Lennart Nacke, and welcomed post-secondary students from all backgrounds, disciplines, faculties, and departments to acquire the skills needed to take game ideas to a prototype. Nacke and a team of mentors lead university students, many of whom had no prior design experience, through workshops to make their ideas come to life. Specifically, games for mental health have become a recent focus point of researchers affiliated with the Games Institute at the University of Waterloo. A specific example of this is the game Above Water that was developed at the HCI Games Group by a team of graduate students led by Ph.D. student Rina Wehbe (see video below). More games for mental health are currently under development in the group. 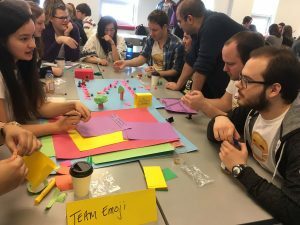 Taking the theme of building games with a purpose, students were encouraged to target topics in mental health and wellbeing. Many great ideas were generated. All students worked extremely hard and pitched their idea to business owners and game development professors. In the end, the decisions were difficult to make. The high quality of the games under the time constraints was noted by several judges. The winning team at the end of the workshop, Make Something Great (Again), built a two player game where each player controls a circle that is tied to the other one, forcing players to work together to win the game. More information regarding the event can be found on the University of Waterloo Stratford website here. Keep an eye out if you are interested in participating in an upcoming game jam at the Games Institute on the main campus or another user experience camp at the University of Waterloo Stratford campus. There will be more opportunities in the future.